The majority owner of the Toronto Maple Leafs and Toronto Raptors sold its stake in the company that owns both teams. The Legal Blitz caught up with Jeffrey MacIntosh, a professor of corporate law at the University of Toronto Faculty of Law to discuss the effect of minority shareholder rights that could have prevented the sale. After eight months of hanging a “for sale” sign on one of the most storied pieces of property in Canada, the Ontario Teachers’ Pension Plan finally sold its majority stake in Maple Leaf Sports & Entertainment (MLSE), owner of the Toronto Maple Leafs hockey team. The majority position is now split between Bell Canada and Rogers Communications (who already owns the Blue Jays). 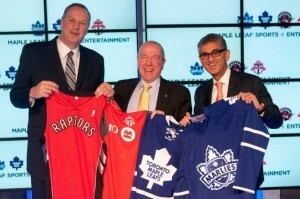 MLSE also owns the Toronto Raptors, the Air Canada Centre, MLS’ Toronto FC, and the Toronto Marlies of the AHL. Before the sale, Larry Tanenbaum owned the remaining stake, as well as a right of first refusal to any sale. Tanenbaum increased his stake to 25% as a result of the agreement. Although the sale ended up going through, we at The Legal Blitz felt it helpful to explore the question of minority stakeholder rights in the sports franchise context, in light of Tanenbaum’s right of first refusal, which he chose not to enforce in this deal. In our normal form, we decided to bring in an expert to assist us in this regard. Jeffrey MacIntosh holds the Toronto Stock Exchange Chair in Capital Markets Law at the Faculty of Law and is a past Associate Director and Director of the Capital Markets Institute at the University of Toronto. He holds law degrees from Harvard and Toronto, and a bachelor of science degree from M.I.T. Prior to joining the University of Toronto, Professor MacIntosh served as an assistant professor at Osgoode Hall Law School. He was appointed a John M. Olin Fellow at Yale Law School in 1988-89. He also served as a member of the Ontario Securities Commission Task Force on Small Business Financing. Are there any differences between corporate law in various U.S. jurisdictions and corporate law in Canada (or Ontario in particular) that would be especially relevant to the Maple Leafs case in the event of a minority shareholder dispute? There are some major differences in U.S. and Canadian corporate law. Perhaps the biggest one relates to the issue of “to whom are directors’ duties owed”. The U.S. is a shareholder-centric universe. By contrast, the Canadian Supreme Court has recently ruled (in Peoples Department Stores Inc. v. Wise,  2 S.C.R. 461, and Re BCE,  2 S.C.R. 560) that directors’ and officers’ fiduciary duties are not owed to any corporate constituency in particular – whether shareholders or others. The case involved interpretation of a standard provision in Canadian corporate law statutes stating that every director and officer has a duty to “act honestly and good faith with a view to the best interests of the corporation”. At all times, directors and officers owe their fiduciary obligation to the corporation. The interests of the corporation are not to be confused with the interests of the creditors or those of any other stakeholders… [T]he directors must be careful to attempt to act in its best interests by creating a “better” corporation, and not to favour the interests of any one group of stakeholders. These decisions have created a great deal of confusion about exactly how we define a derivative, as opposed to a personal action – and what evidence must be adduced to succeed in a derivative action. 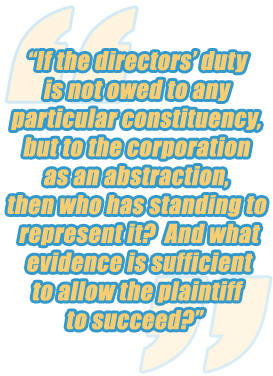 If the directors’ duty is not owed to any particular constituency, but to the corporation as an abstraction, then who has standing to represent it? And what evidence is sufficient to allow the plaintiff to succeed? At the very least, however, these decisions seem to indicate that it is not just minority shareholders who might sue alleging a breach of fiduciary duty, but just about any corporate constituency who feels that the conduct of the directors has prejudiced their interest in the corporation. While Canadian courts have historically taken their cue from U.S. courts in defining the business rule (with some differences), these decisions have also made it very unclear what a board must do to win the protection of the rule. In a shareholder-centric universe, the deliberations of an independent committee will focus on the shareholders. Any outside advice will be directed toward determining the effect of a transaction or decision on shareholders. In the poly-centric universe defined by the Supreme Court, it is no longer clear what the independent committee’s deliberations look like, or the mandate that they give to any outside advisors that they hire. Despite these complications, and the wider range of potential plaintiffs, the Supreme Court decisions may actually have reduced the probability that directors or officers will be held liable for particular actions. The Supreme Court held that the board’s decision of which constituencies to have regard to in determining the best interests of the corporation is covered by the business judgment rule. Thus, if the board properly papers its decision by showing that it considered the welfare of multiple constituencies, and if it can tell some plausible story that its decision made the corporation a “better” corporation, directors should be able to dodge any liability. Another difference in Canadian and U.S. law is that Canadian statutes contain an “oppression remedy” that is applied not only to private corporations (as in some U.S. states), but public corporations as well. The substantive standard is essentially “fairness” (which in turn is based on reasonable expectations), and a finding of oppression may be made absent any evidence that the directors acted in bad faith. The key is whether the directorial or corporate conduct treated the plaintiff unfairly – not whether it was intended to do so. In most provinces, including Ontario, the courts have held that they oppression remedy applies to disputes that are essentially derivative in nature – i.e. that work a harm to the corporation. The result of this is that in Canada a plaintiff gets two kicks at the can; one under the statutory fiduciary duty, and the other under the oppression remedy. This greatly increases a plaintiff’s chances of success. The Supreme Court decisions referred to above held that the oppression remedy is available to the same broadly defined class of plaintiffs as the fiduciary duty – the only caveat being that the oppression remedy requires that the plaintiff demonstrate harm to a security holder, creditor, director or officer. It is also worth noting that while the Canadian courts have steadfastly resisted imposing a fiduciary duty on corporate shareholders (either to other shareholders or to the corporation), they have nonetheless fashioned what a de facto shareholder fiduciary duty under the oppression remedy. This duty is imposed not only on majority or controlling shareholders, but on minority shareholders as well (e.g. in a holdout situation). This de facto duty is more extensive than the fiduciary duty imposed on shareholders in U.S. law, as the substantive standard is, once again, “fairness”. What is the extent of power that a minority shareholder could have asserted in a case like the Maple Leafs? It is my understanding that the only other shareholder is Larry Tanenbaum, who owned 20% of Maple Leaf Sports and Entertainment (“MLSE”). Press reports suggest that Mr. Tanenbaum is onside – and indeed brokered the agreement. Thus, it does not appear that there are any minority shareholders who will complain. As I indicated above, however, that does not mean that non-shareholders interests could not complain. Nonetheless, the transaction involves a sale of the Ontario Teachers Pension Plan’s 79.5% stake in Maple Leaf Sports and Entertainment to Rogers Communications and BCE. It will be an uphill battle for any complainant to assert either breach of fiduciary duty by the directors or unfair treatment under the oppression remedy. Canadian courts have made it clear that controlling shareholders can sell to whomever they wish. It thus seems unlikely that any complainant would succeed in opposing the transaction. If the desired sale is truly in the best interests of the corporation – and the team/fans for that matter – but a minority shareholder refuses to bend, is there any remedy to achieve the majority’s goal? As per above, there was only one minority shareholder, and he is onside. Even if he wasn’t, without extenuating circumstances, it would be difficult to argue that the sale of a block of shares violated anyone’s fiduciary duty or the oppression remedy. Since the Maple Leafs are a franchise established in Canada but part of a U.S. organization, what international law barriers could certain corporate law disputes create? The usual conflicts rule with respect to corporate law is the same in Canada as the U.S. – wherever the litigation occurs, if there are corporate law matters in question, then it must be resolved according to the corporate law of the jurisdiction in which the corporation is incorporated. It is not at all unusual for litigation to occur in the U.S. relating to Canadian corporations – and the courts have (with very few exceptions) applied Canadian law. Canadian law is proved in the U.S. court using Canadian corporate law experts.